Sadly, Rosemary Hellyar, one of the founding members of Friends of Town Quay Park, died in her home at Ironside Court at the end of February, just 3 months short of her 89th birthday. Rosemary, along with her good friend Fiona Roberts, was very active in the 2009/10 campaign to save Town Quay Park from housing development. She remained a very dynamic, active and positive friend to FTQP from then on, boosting membership, helping out at events and always joining in activities with great glee. 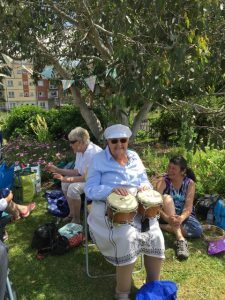 Her joyful drumming and energetic efforts at tennis with youngsters a tenth of her age at FTQP picnics will long be remembered. We’re thankful to have enjoyed her support and friendship, will miss her cheerful presence and remember her with a warm smile.